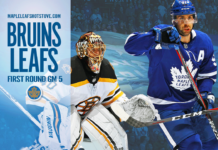 Coming off of a good comeback win over the Pittsburgh Penguins on Saturday, the Toronto Maple Leafs will look to string together two straight wins for the first time since late December when they host the Anaheim Ducks tonight at Scotiabank Arena (7 p.m, TSN4). While the Leafs look to rediscover their consistency after a win-one-lose-one pattern for the past month, it’s back to struggle city for the Anaheim Ducks, who have lost their last three, including a 9-3 loss to Winnipeg on Saturday. Just a couple of weeks removed from a franchise-record 12-game losing streak, the Ducks gave up six goals in the first period against Winnipeg — another new franchise-record — bringing the inevitable personnel changes closer and closer to reality. For a team that boasts above average talent on defense and in goal and Ryan Getzlaf – Ryan Kesler – Adam Henrique down the middle up front, there is (rightfully) much more expected from this group. Anaheim made four trades in the span of three days following their massive losing streak — the most significant of which were the acquisition of Devin Shore from Pittsburgh for longtime Duck Andrew Cogliano and Michael Del Zotto from Vancouver in exchange for Luke Schenn and a seventh-round pick. Both trades were arguably sideways moves — at best marginal upgrades — more than true shakeups, as GM Bob Murray has attempted to shuffle the deck while holding off on pulling the trigger on a seemingly overdue head-coaching change. In terms of shot and goal share, unsurprising to Leafs fans who weren’t able to scrub the Randy Carlyle era from their memory banks, the Ducks are 27th in shot attempt percentage, 30th in scoring chance share, and dead-last in slot shots share. If you take at the Ducks unblocked shots heat map from their last ten games, as well as the matchup stats comparison down below, it is a clear visualization of their struggles. The Carlyle systems design of collapsing into a prevent-style defense and giving up copious amounts of perimeter shots has always carried the inherent contradiction of conceding tons of shot volume in the low slot around their own net as well. It’s something of a death-by-a-thousand-paper-cuts situation when a team spends so much of the game inside its own zone — inevitably, it results in giving up more of everything, overtaxing the goaltender, and demoralizing the players. The Leafs will make no changes to the lineup that won against Pittsburgh Saturday, other than Frederik Andersen taking back the crease in place of Garret Sparks. It’s a battle of two goaltenders deserving of Vezina consideration tonight in Andersen and John Gibson. Even during the Leafs‘ recent inconsistent stretch, with Andersen in net for three losses in his last five starts, he’s been really solid with a .917 save percentage, while Gibson has maintained a .916 save percentage despite a heavy start load behind one of the most porous teams in the league (1,375 shots against is significantly more than any other goaltender). I think we’ve played some really good hockey here of late. Played a real good game against Tampa, played a real good game against Washington, didn’t mind our game against [Arizona], liked our game the other night. We’ve got to do it every night. You can’t be hit and miss. We’d like to bottle that and do it on a consistent basis, or more consistent. I think that’s the measure of a good team — you can find a way to do it night after night. There are 82 games. There is no team that plays good every single night. The more talent and the more you score, the more of those games you win. Our power play hasn’t been as good as of late so we’re not getting any extra goals. We’re going to have to earn them right now until we get our feel back in that area. We’ve talked about that as well. Those teams get you ready, with [non-playoff] teams, you’ve got to get yourself ready. In saying all that, the game against Detroit, I didn’t think we were great at all, but we were set up perfect and we didn’t execute at the end. That’s the bottom line. It was the same against [Arizona]. He hit the net. It’s got red around it; if you hit it, you get points. It’s just so simple. It’s hard, though, for a D in the national league because there’s so many people in front of you. We don’t question his ability to break out the puck. We don’t question his ability on the offensive blueline. Where he needs to grow — and that’s what Ron Hainsey is going to help him with — is you’ve got to stand in the right spot in d-zone. The puck can’t come through you in d-zone. You can’t step up and let people go by you. He’s a prototype of today’s NHL defenceman. It’s what everybody is looking for. They are looking for the mobility. They are looking for the minute-muncher; the guy who can go back and get the puck and carry the puck or move the puck effectively. He can be a bit of a hardass sometimes. I don’t think it’s a bad quality to have in a coach. I think there’s always fine line or you’re going to lose some players if you’re consistently not positive.